La Mercè 2017 is the main event on Barcelona’s festival agenda, uniting all of its neighbourhoods and serving as the city’s Festa Major. This year it aims to extend further throughout the city by adding even more new venues and activities. 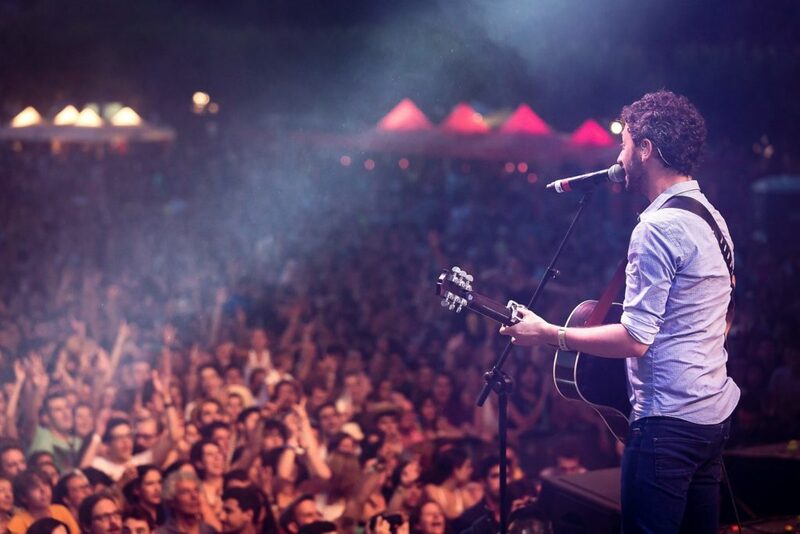 Every year, Barcelona invites a city from around the world to jointly celebrate the festival. This year Icelandic capital Reykjavik has been invited to be this year’s special guest city and will be honoured throughout La Mercè. Overall, it is a religious festival that has been celebrated since the Middle Ages and observes the holy feast day of Our Lady of Mercy. It is the biggest weeklong festival in the city and an age-old tradition, but there are very up-to-date activity items as well, such as specialty markets, art displays and musical performances for example. Catalunya has a great tradition for processions of giants or bigheads, which are tall, hollow structures with very large papier-mâché heads, each with a unique identity and character. They are carried on top of people’s shoulders in a parade as they dance and run at the crowds. Also, there are the Bestiari – which are figures of medieval, folkloric creatures. This parade happens on the first day of the La Mercé celebrations. 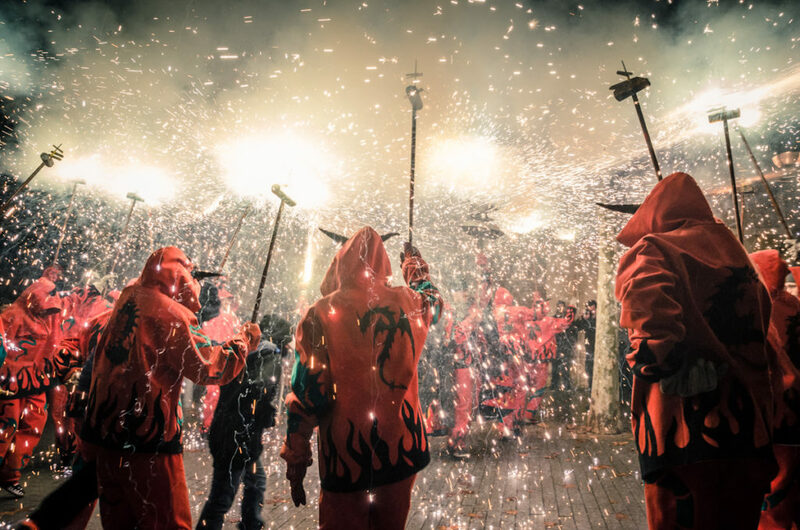 The famous fire run is always on September 24 – the actual saint’s day for La Mercé. Performers dressed as devils and fiery dragons dance in a long procession through the city. Hordes of “diables” hoist pitchforks, or forquilles, above their heads, with spinning fireworks attached that spray in all directions. If you’re going to get a close-up photograph, then protective clothing is advised. There is also an early fire run for children. The Catalans are very good at building human structures. In fact he last few world records – 10 persons high – have been have been set in the region. Participants, or Catsellers, climb on top of each other, interlocked into a delicate balancing act to get people to reach into the sky as far as possible. 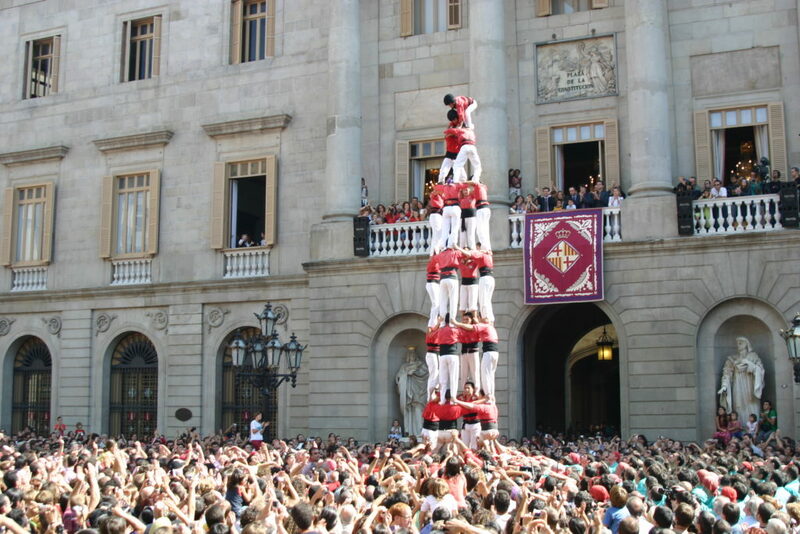 The human tower is supported by a large number of people at the bottom, and then it’s a race to reach the highest point in strict formation before the structure breaks. 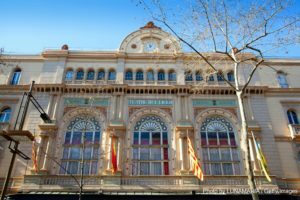 Barcelona Acció Musical has been running for over 20 years and hosts more contemporary rock and pop music concerts. It runs in parallel to the main festival, and as Reykjavik is the partner city for this year’s La Mercé, then a contingent of its artists will perform, as well as national and internal artists. 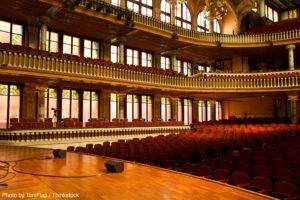 Concerts usually take place at Plaza Real, Plaza Catalunya and at the MACBA, among many other intimate places and open-air venues around the city. 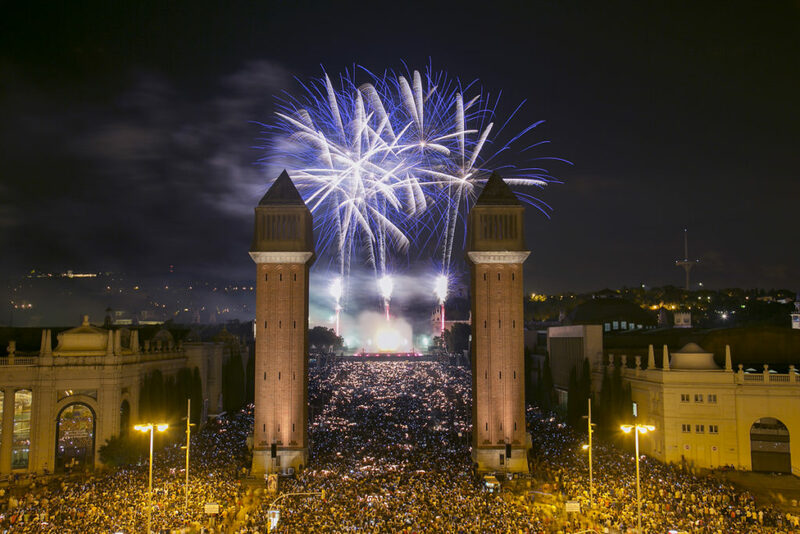 This is a critically acclaimed, professional fireworks display that takes place on the last night of La Mercè 2017 on Avinguda reina Maria Cristina. You need to arrive early for the big finale, as thousands of people gather to watch this spectacular show. Check the official agenda for more firework displays and digital light mapping events throughout the festival, at http://lameva.barcelona.cat/merce/en. 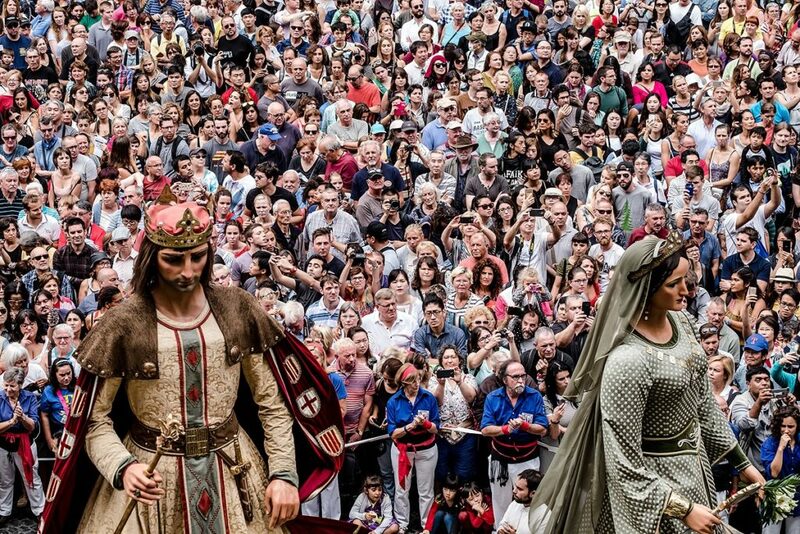 The La Mercè Festival is a great way to see Barcelona at its best. Your stay could be much more convenient with your own apartment. Check our website for an excellent selection of short-term holiday rentals so that your stay in the city is as comfortable as possible. Creating a vacation itinerary for a trip to Barcelona could be one of the most challenging tasks you’ve ever attempted! This exotic city is absolutely bursting with so many spectacular sights, restaurants, and activities. You might have trouble wondering where to start! 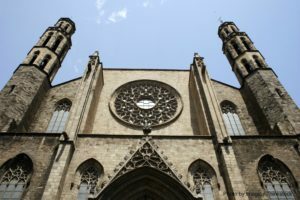 One spot you don’t want to miss is the Basilica Santa Maria del Mar. Thousands of years old, this extraordinary cathedral is filled with wonders. Take a look at what this historic site has to offer and add it to your vacation itinerary today! Construction of the Basilica Santa Maria del Mar began in the year 1329. It was completed in 55 years, which was a surprisingly short amount of time to build a cathedral of such size during this particular time period. This church was funded almost solely by local residents of its surrounding neighborhood, known today as La Ribera, a community located on the shore that specialized in shipbuilding as well as constant imports and exports. The magnificent architecture of this cathedral is enough to make your jaw drop. The Basilica Santa Maria del Mar displays the perfect example of distinctive 14th century Catalan Gothic architecture. In addition to its towering appearance, this beautiful masterpiece is also filled with incredible artwork. Gaze at the numerous, colorful stained windows that adorn this cathedral in awe. This intricate pieces are from several different time periods, some of which are originals that were created when the cathedral was first constructed. You’ll also be able to observe a Gothic structure of the Virgin Mary as well as numerous paintings and priceless relics. This attraction is open from 1:00 p.m. to 5:00 p.m. Monday through Saturday and 2:00 p.m. to 5:00 p.m. on Sunday. You can also attend Mass here every day at 7:30 p.m. Guided tours of this breathtaking cathedral are highly recommended. During a guided tour, you are led up to the rooftops of the church, the rear chapels, then all the way down to its crypts. You will also be able to learn more about its fascinating history. Take a look at their website to discover their prices, schedule, and much more. If you want to see more of Barcelona’s finest landmarks, visit the Casa Batllo! Complete your vacation of a lifetime by staying in the best accommodations while you’re visiting some of Barcelona’s finest attractions! bizFlats Vacation Rentals provides some of the most luxurious apartments, villas, and lofts, all located throughout the most picturesque parts of the city. Choose from staying in a beautiful spot with views of the beach or right in the heart of the bustling city. Each property is equipped with the finest furnishings and amenities so you’re bound to feel right at home. Check our availability today to find the most incredible place to stay during your visit! Barcelona is an extraordinary city overflowing with all kinds of sights and attractions. Due to its rich and fascinating history, this destination is filled with various museums, galleries, and other historic sites that were created to honor this city’s past stories and leaders. 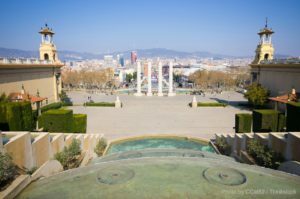 One of the best places to explore Barcelona’s history and culture is the Parc de Montjuïc, an attraction bursting with things to do and see. Once a ceremonial place of the Romans, this mountain is now a beloved recreational area. Learn about all the activities you can enjoy here and start making plans to visit during your vacation to Barcelona! One of the best parts of visiting Parc de Montjuïc is the way you get there! 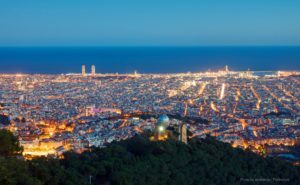 This mountain is accessed by way of the Montjuïc cable car, which carries you higher and higher above Barcelona, providing breathtaking views of the dramatic scenery spread below. Many museums can be found within the magnificent Palau Nacional, a spacious pavilion center. One of the best museums found in here is the Catalan National Art Museum, which contains countless, valuable works of art, spanning a wide spectrum of styles and time periods. The famous Joan Miró Foundation is another incredible museum located in the Parc de Montjuïc. You can also observe countless monuments that resulted from the 1992 Olympic Games that were held here, like the Calatrava Tower, the Olympic Stadium of Barcelona, and the Sant Jordi Palace. The Montjuïc Castle is a timeless gem within Barcelona. Standing strong since 1640, this forbidding structure was once a military fortress and served as a defense point in the War of the Spanish Succession. Today, you can take a guided tour of this castle as well as receive some of the most stunning views of the surrounding scenery. You can spend hours and hours within the Parc de Montjuïc and still not see everything it has to offer! One highlight you won’t want to skip is the Magic Fountain. Located within the Palau Nacional, this is one of the most photographed icons of Barcelona. The Montjuïc Gardens are another gorgeous feature, as well as the Poble Espanyol, a historic Spanish village. Come Stay with Us at bizFlats Vacation Rentals of Barcelona! Complete your vacation of a lifetime by staying in the best accommodations while you’re visiting some of Barcelona’s finest attractions! bizFlats Vacation Rentals provides some of the most luxurious apartments, villas, and lofts, all located throughout the most picturesque parts of the city. Choose from staying in a beautiful spot with views of the beach or right in the heart of the bustling city. Each property is equipped with the finest furnishings and amenities so you’re bound to feel right at home. Check our availability today to find the most incredible short term rental in Barcelona! 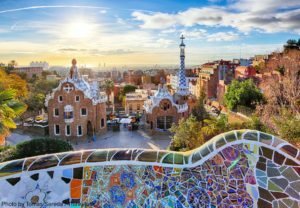 Although Barcelona has countless extraordinary attractions, Park Güell is one you absolutely can’t skip! Learn all about this beautiful treasure and buy your tickets today. This colorful attraction was originally commissioned by Eusebi Güell, who desired an upscale estate for the aristocrat of Barcelona to live in. 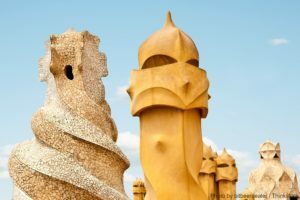 The famous Antoni Gaudí (the architectural genius behind other iconic Barcelona landmarks like the Sagrada Familia and Casa Batllo) was chosen to design this area; he began its construction in 1900. Güell had spotted a beautiful window display that Gaudí had created one day and decided at once that he was the right man for the job. Gaudí used his trademark style of bright colors and swirling patterns to establish a private estate that was truly unlike anything else around. He built numerous villas for the wealthy figures in the area and even moved in himself a few years later. However, this area lacked one essential thing: a good transportation system. Due to this, people started abandoning their homes here a few years later and the area transformed into a private garden for public events. It later became a public tourist attraction in 1960s so everyone could appreciate this magnificent place. You can spend hours and hours here at Park Güell. One of the main reasons why it draws so many visitors is the Gaudí House Museum located here. This building, which was once Gaudí’s home, contains countless artifacts and memorabilia that offer incredible insight into the life of this extraordinary and revolutionary architect. You can also participate in guided tours of the other buildings in this park to learn more about Gaudí, the Modernisme movement, the people who loved here, and other interesting Park Güell facts. The Park Güell hours vary from season to season, so check online before you visit so you know when to go. This park is located off Carrer d’Olot in Barcelona. Metros, buses, and taxis are all able to access this spot; you can also arrange for a coach to pick you up if you’re arriving with a group. You can purchase your tickets at the Park Güell ticket office or you can conveniently buy them online. Ticket purchases can be made up to three months before your visit, so start planning ahead and buy your tickets today to skip the lines! Complete your vacation of a lifetime by staying in the best accommodations while you’re visiting some of Barcelona’s finest attractions! bizFlats Vacation Rentals provides some of the most luxurious apartments, villas, and lofts, all located throughout the most picturesque parts of the city. Choose from staying in a beautiful spot with views of the beach or right in the heart of the bustling city. Each property is equipped with the finest furnishings and amenities so you’re bound to feel right at home. Check our availability today to find the most incredible short term rental in Barcelona to stay during your visit!